When “The Man” murders his brother, pumps heroin into local orphanages, and floods the ghetto with adulterated malt liquor, BLACK DYNAMITE is the one hero willing to fight all the way from the blood-soaked city streets to the hallowed halls of the Honky House. 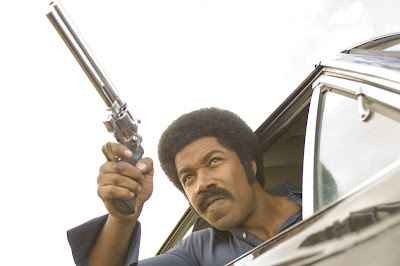 Michael Jai White (The Dark Knight) stars as BLACK DYNAMITE, a gun-toting, nunchuck-wielding, ladies man and soul brother. Written and directed by Scott Sanders (Thick as Thieves), BLACK DYNAMITE also stars Tommy Davidson, Nicole Sullivan, Bokeem Woodbine, Arsenio Hall and John Salley. BLACK DYNAMITE opens in theaters on September 4, 2009. Oy veh...what we need is a dead frickin' serious re-boot of the whole genre, not another tongue-in-cheek, wink-wink comedy. This is sad...let's hope the soundtrack is at least daring. I saw this at a festival and it is hilarious. Can't wait till it hits the theatres! The official release is 10/16! no worries about the soundtrack. It's been in the makings for around 2-3 years now, and it is 100% authentic. I know because I worked on it, and have been listening to the grueling mixdowns day-in day-out for the passed 3months or so... and not only is there a Original Soundtrack, but an original band as well. Hit me up for all the info. peace!